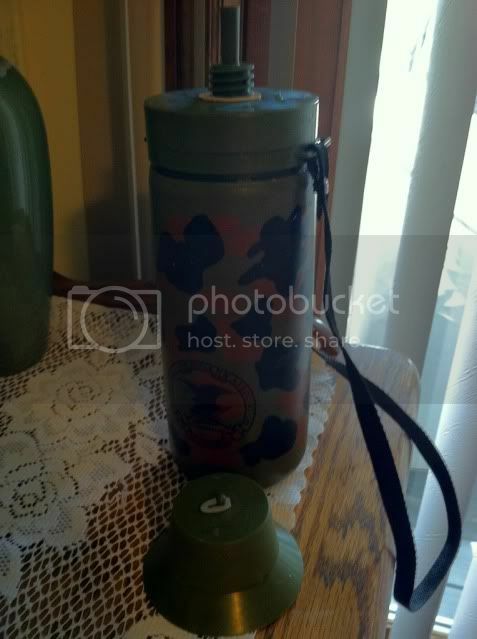 Has anyone come across a serviceable light weight thermos suitable for light weight backpacking? Even the small plastic ones I've seen are relatively heavy. Guess I might have to give up on "off the shelf" and fashion something "DIY". Perhaps a light plastic container + insulated cozy or just an insulated envelope to house a freezer bag and its rehydrating contents. I'm not sure of your intent for the lightweight thermos. Is it to carry a beverage or to insulate a freeze bag meal? I use the zip-loc storage containers for my mess kit and have fashioned a neoprene cozy for cold weather application. I'll look for a link for you. 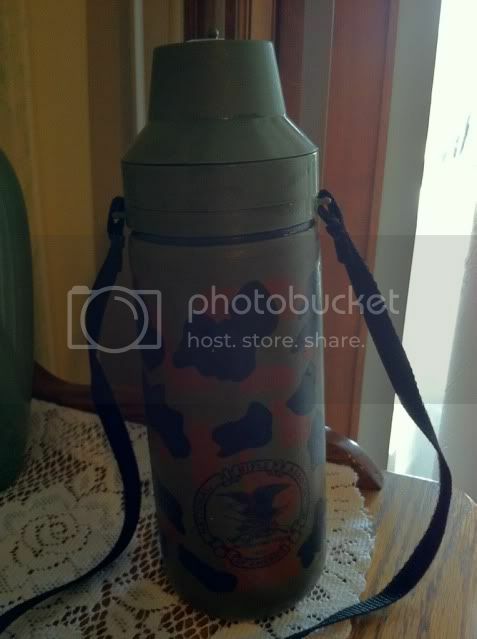 If you are looking for a lightweight thermos bottle, I picked this NRA bottle up at a yard sale for a quarter It has a camo neoprene sleeve around a plastic bottle. I choose meals that rehydrate within 5 min. No insulating necessary. 180-190 degree water sitting in a freezer bag for 5 min will drop down to 150 degrees which is almost too hot to eat right away, have to blow on it a bit before scoffing it down. I eat fast then sit back with a warm drink and watch the camp fire. Check the "baby" dept at Kmart and Walmart for insulated containers. 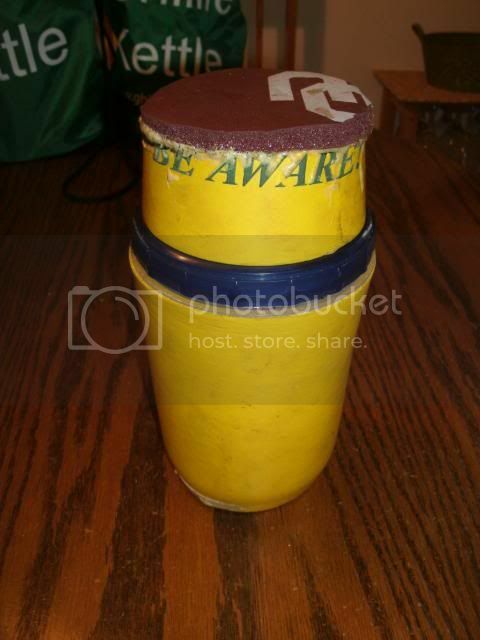 At one time they had containers that had insulated DC electric heating wires in the bag that surrounded the container. Look for that also. thank you both for your thoughts. I enjoy cooking and even when moving ultralight I like to indulge my gourmet side. I use thermos containers for both FB style cooking and keeping things warm. I also like to pack in frozen food items and try to keep them for as long as possible. The lightest cheapest thermos containers i've seen cannot beat a thermal envelope and freezer bag. 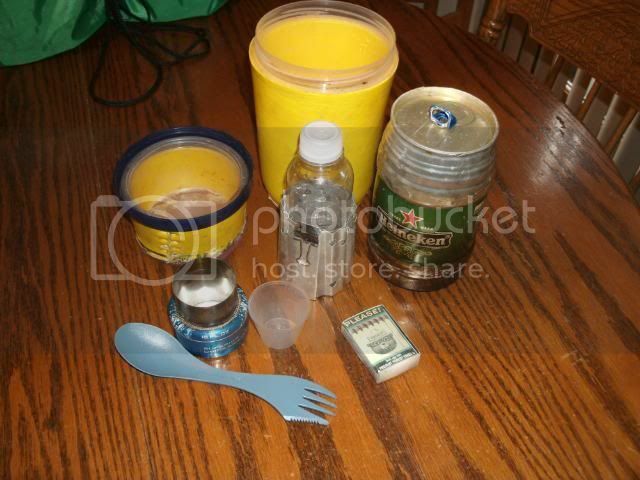 I'm thinking about using super light plastic containers of the tupper kind and fashioning insulators for them. Aluminized bubble insulation and thinsulate/silnylon would do the job. Also, today at the supermarket I saw some large "pool noodles" fashioned out of some lite expanded plastic - very lite weight hollow tubes, 1"thick walls, 6" diameter and 6' long. A segment of this stuff would slip nicely over various round containers and water bottles. I pick up the foam/foil windshield covers(to put over windshields to keep snow/ice off) from thrift stores for use for cozies for about $.50 to $1 each or even less(garage sales 10c to 25! )..Use as many layers as you need along with some good lightweight tape..over any shape of container that works for what you need to carry... or make/sew/tape bags and sew on some velcro closures..or even longer bags with roll up closures with string for more insulation layers)..They weigh next to nothing,cut easy with scissors,insulate well..easy to work with,as long as you can work with about 18" wide X 6' pieces. realityguy wrote: I pick up the foam/foil windshield covers(to put over windshields to keep snow/ice off) from thrift stores for use for cozies for about $.50 to $1 each or even less(garage sales 10c to 25! )..Use as many layers as you need along with some good lightweight tape..over any shape of container that works for what you need to carry... or make/sew/tape bags and sew on some velcro closures..or even longer bags with roll up closures with string for more insulation layers)..They weigh next to nothing,cut easy with scissors,insulate well..easy to work with,as long as you can work with about 18" wide X 6' pieces. We all have had a creative interest in making life easier and lighter while enjoying a warm/hot meal.